Wow that sounds so good! I want one now… and that cookbook! Hi Melissa,This looks so good. 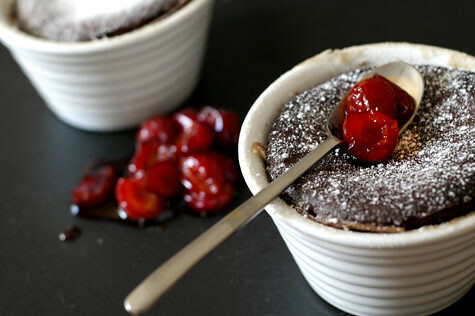 I love chocolate and cherries, so this is a must try when I have the time! =) Thank you for sharing! Hi Clare – The cookbook is great – I highly recommend it. It manages to strike that perfect balance between sophistication and ‘do-ability’!Hi Reid – I love chocolate and cherries as well, especially when the cherries actually taste like something! (I’ve had a few too many tasteless Black Forest Cakes, unfortunately…)Hi Tara – Thank you 🙂 It seems I’m on a constant learning curve! Melissa,I would love to see a post on how to properly temper chocolate for truffles — whenever I have tried to make them, I have had to keep them cold. No recipe I’ve seen has mentioned how to combat that issue. im speechless.. except for one big long sigh as Im imagining myself eating that chocolate right out of that picture. Dear Melissa, beautiful photo composition! I experienced a broad variety of problems inverting/unmolding desserts in the past, but if one owns such nice ramekins – they’re more than perfect 🙂 Would have loooooved to try one! hi mel, do u have any scrumptuous ideas for our wedding buffet? we need to impress matyldas bf who used to work in a michelin rated place… oh, n we need to impress u as well! further evidence of my heathenry: my high school days were spent in palo alto, and i probably only went into cocolat in the stanford shopping center maybe twice. once that i remember. i could use the defense that i’ve never had a predilection for chocolate, but i do know i had a vehement reaction against the logo. i believe my undying devotion to the face magazine, i-D, and neville brody turned me against cocolat at a formative age. although i own several alice medrich cookbooks, none of them had made much of an impression, but it has been years since i’ve opened them up. perhaps, with the death of the face (RIP), my own rather sluttish design aesthetic, and the grudging admittance that i currently have ten pounds of couverture chocolate in my pantry, it’s time to revisit her. Hi Melissa, Always am entertained by your copy and photos! I have two of Alice’s books and agree they are great.I am sending you an email asking you to participate in the new MEME from Oliver of Delicious Days. Oh Santos, can you believe I didn’t even realize Cocolat morphed into a chain? I mean, I think I remember that there was a second location in Berkeley, but you make it sound…well, like Starbucks! Seeing as my only experience was with the original, and I was pretty young and impressionable at the time, if you don’t mind I’ll just keep my picture-perfect memories and forget you ever said anything about the Stanford shopping center… ;)Hi Chefdoc – Glad you agree about Alice Medrich – I was starting to doubt myself here! And I’m honored to continue Nicky and Oliver’s meme. There’s going to be a lot of meme action going on here over the next few days…watch this space! Cherry fever must be in the air because I’ve also been playing with recipe ideas. I spotted the brandy in the compote right away and immediately began salivating…chocolate and cherries=YUMMY!Regarding your comment about the duck/pear recipe–ha!–wouldn’t you know, I picked up one of those $5 spanish recipe books at Borders and based the dish on that and another version I found online. I believe the recipe was taken from the Basque area, although at this moment, I would not know where in Spain that would be. Heck, I just wanna go there and eat! Hi Rowena – I thought I recognized the dish from Barcelona, though I must say I didn’t know they ate anything like that in the Basque Country as well – and I used to live there! I do consider those two regions of Spain to be the best gastronomically – make sure to visit both when you go there! Ah, yes, Cocolat. I walked by the Berkeley store daily in college yet it took my mom to get me inside. I still remember those truffles . . . and the cakes! The cakes! Your post reminds me of my own chocolate history and Cocolat was key. 🙂 Now I have Scharffen Berger . . .where do I go next? hi again, r u over the chocolate craze? i wanna point u in the direction of smoked salmon…! u see i just cannot give up asking u for some advice, n as u know we have our own self-fished wild salmon. we r thinking of smoking a little off it for the buffet. what can we serve it with? eggs seem a bit boring? ps. ur blog is going marvellously well! its buzzing isnt it! Hi AmyBee – Looks like we’ve got some shared history! I want to attempt those truffles, but I’m strangely reluctant – on one hand, I’m afraid to find they won’t live up to memory (is that possible?) and on the other I’m afraid I’ll just sit down and polish off a whole batch! Btw, I saw my first ever mention of Sharffen Berger chocolate in a British food magazine – they were raving about it as ‘one of the top artisan chocolates in the world’. Don’t know if you can beat that – sounds pretty tops to me :)Hi googs – You should know as well as anybody the chocolate craze is never really over 😉 What about a smoked salmon paté? Or something we had at my wedding was small endive leaves with cream cheese, thin slices of smoked salmon and capers, and it was fantastic! I’ll think some more and write you an email, okay? hi from another alice medrich fan. i never went to cocolat but i got medrich’s book at booksamillion for around $35. just thankful that now there are serious chocolate purveyors all over, online and off. your pic is absolutely mouthwatering! Hi! Looks great. I would like to try it but don’t think I can get hold of Cream of Tartar! Is there anything I could use as substitution? Thanx! Hi Melissa,Alice Medrich is one of my favorite cookbook authors too! Chocolate and the Art of Low-Fat Baking inspired my baking philosophy: low-fat can equal luscious desserts! Last summer, I bought Cocolat at Strand’s (a legendary used book store in NYC) for about $15. It’s even AUTOGRAPHED! I originally planned on reselling it on Amazon.com to make some extra bucks, but when I read the book, I couldn’t bear to part with it. I think it’s very similar to Bittersweet, so you aren’t missing out on anything. Hi Jessica – Lucky you – even autographed! I also have a couple of cookbooks I could make a little money on, but some things are just too sacred, aren’t they? Cherries are most probably the sexiest fruit ever in terms of color, shape, etc. Even more than strawberries, or even mango! In terms of symolism; strawberries are more heart shaped = romance. cherries look more like a certain part of the human body = making love.Which leads me to this:This recipe sounds absolutely orgasmic. This is aphrodesiac material. Seriously powerful stuff. Yes! I’ve lost count of how many times various reviews and blogs have made note of the value we chocophiles place on Alice Medrich’s first two books “Cocolat” and “Chocolate and the Art of Low-Fat Desserts”. Those classics have been out of print for years. When you can find them at all, they sell second-hand for triple or more their original price. While Alice’s later books do add tips about high-percentage chocolates, most of the later recipes are tweaks on the repertoire birthed to the world in those first two books (by far the best photographed too). Here’s an idea: Why not collect the acclaim of loyal fans to lobby for getting those classics reprinted? I volunteer to collect ‘virtual signatures’ on a ‘virtual petition’. Email me — cocaomama@yahoo.com — with your moniker and email address — I’ll send them on in batches of 10, and report back periodically on our cumulative numbers. Dear Alice Medrich, Please update and reprint your classic books “Cocolat” and “Chocolate and the Art of the Low-Fat Desserts”! I want them and I’ll buy them! Signed ____________________. What a great post about Alice Medrich. I too, am a fan of her cookbooks, and am blogging about a couple of her recipes. I just made her intensely bittersweet souffles.